Now that you’re an adult, the desire to sport a mouth full of metal doesn’t exist. Maybe when you were a teenager, you’d be okay with showing off your colored brackets and rubber bands. However, now that you’re older, you need an effective solution that doesn’t have you dreading that upcoming presentation you have to give to prospective clients. 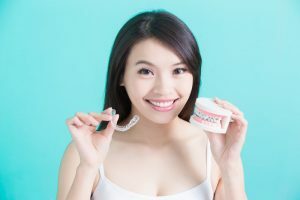 Invisalign braces is an orthodontic treatment that is made up of clear, plastic aligners that are used to gradually shift your teeth into the appropriate place. These removable aligners are virtually undetectable by others, and with proper use, you’ll have a beautiful, confident smile. They’re clear. There’s no need to worry about the metal brackets and wires that traditional braces required. No one will ever know you’re wearing braces because Invisalign aligners are made of clear plastic. They’re removable. Invisalign aligners are removable, whereas traditional braces must stay on all the time. With Invisalign, there’s no need to worry about food getting stuck in wires or brackets! When you eat or drink, you must remove the trays, making it easier and less awkward while eating out with your friends. They’re less irritable. If you’re worried about the irritation metal brackets and wires can cause on your gums, don’t be. There are no pieces that stick out with Invisalign braces, so you’re less likely to experience gum irritation. They gently move your teeth. Traditional braces use brackets and wires to force teeth into position. Invisalign uses customized trays that gradually move your teeth into place with each new set. This decreases the amount of discomfort your mouth will feel. They’re easier to maintain. Have you ever used a water pick? With traditional braces, it’s a beneficial tool to make sure there’s no food stuck in or around the braces. However, with Invisalign, you just simply remove the trays and soak them while brushing and flossing your teeth like normal. They require fewer visits to the dentist. Traditional braces require the wires be tightened, on average, every six weeks. With Invisalign, your dentist will give you multiple sets of aligners, so every two weeks, all you have to do is change them out at home. Invisalign braces are a great alternative to achieving a straighter smile. Your dentist will work with you to determine a timeline, so you can have a better idea as to how long you’ll need treatment. Market Heights Family Dental offers comprehensive care to you and your family. If you’re looking to achieve a straighter smile, our dentists and team of experts can help you determine the best method for your individual dental needs. To find out how we can help, or to learn more about our services, contact us at (254) 699-3565.